Go though the extensive lists of best product & machine design software which are useful for drafting, design and product manufacture. These softwares will provide great benefits to the designers and engineers over various disciplines ranging from manufacturing, product design, automotive, and aerospace. By applying them, the users can produce accurate 3D models of parts, components, and assemblies to streamline engineering, manufacturing, and design progressions. The users can easily design, reproduce, envisage, and manage all the products digitally. CATIA – One of the best cad packages for cad & product design. It offers generative shape design, assembly design & part design. Rhinoceros - Rhino can be applied to generate schematic design - level concept models and families for import into Revit. Inventor - Inventor® 3D CAD software consists of simplified toolset for 3D mechanical design, documentation, and product simulation. AutoCAD Mechanical - This AutoCAD based software is designed for manufacturing. It provides great solution for the Digital Prototyping as it contains all the key features of AutoCAD. Besides, it also contains extensive libraries of standards-based parts and tools to make common mechanical CAD tasks automatic as well as speeds up the mechanical design process. Solid Edge - It comes up with entire hybrid 2D/3D CAD system that applies contemporary technology for speeding up the design process, quick modification, and superior imported reprocess. PTC Creo Parametric - PTC Creo Parametric contains a wide range of strapping yet manageable 3D CAD adeptness to expedite the operation of product evolution. Siemens PLM NX for Design - NX for Design offers complete product design solution that simplifies and speed ups the product development proceedings for engineers who desire to produce ingenious products in a accommodative environment. IronCAD - IronCAD is mostly useful for providing stunning 3D Design Collaboration Solutions that guide the industry in their accessibility and design productivity. Inventor LT - It is a handy 3D modeling software that can import any autocad preliminary drawing for transforming it to a 3d model. The software is useful to simplify the detailing process. Ansys - It offers comprehensive model Simulation through stress analysis and heat transfer. Once the analysis is accomplished, the visualizations can be effortlessly interpreted. 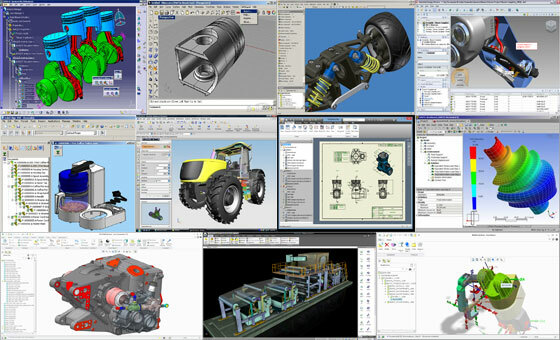 PTC Creo Elements/Direct Drafting - PTC Creo Elements/Direct Drafting also known as CoCreate Drafting, is a thorough 2D CAD system that contains strong assembly management and 2D parametric attributes to facilitate the users conforming accessible drawings as well as generate families of parts or drawings smoothly.